The last month was really a stressful one for me and J, and as the new month rolled in, we were eager to embrace any form of relaxation and chill moments that were within reach. Thankfully, the weather is now changing to welcome winter and this makes for a perfect evening out in an al fresco dining space. 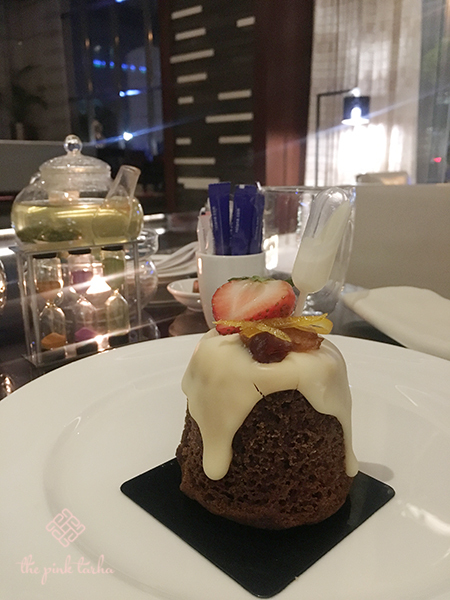 We may still have Rotana Hotel fever going through our veins after our recent trip to Bahrain so we found ourselves in the Rosh Rayhaan by Rotana in Olaya St. last night, trying out the newest addition to their roster of restaurants, Sama Lounge. 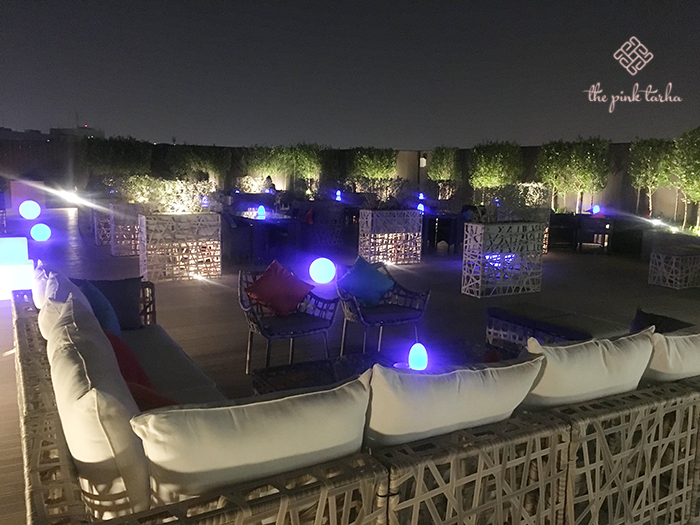 Sama Lounge is located on the 3rd floor of the hotel and is a spacious outdoor terrace for coffee, dining or a simple, intimate evening. A bar area welcomes you on your right while the seating area can be found spread out to your left. The lighting is generally dim, with blue lamps accenting each table and the moonlight sky above adds a sentimental touch to its overall ambiance. A glimpse of the Kingdom Tower from there. 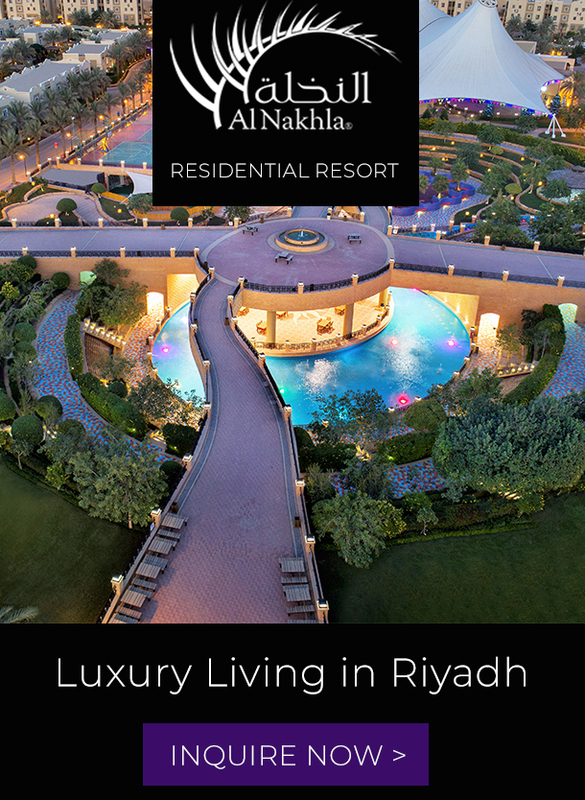 As the name implies, the relaxed setting compels you to lounge quite naturally. As we sat awaiting our service, we could see the Kingdom Tower from where we were seated. We also explored the other side of the lounge where an outdoor swimming pool was adjacent to the nearby Bodylines Gym of the hotel, called Oasis. We were told that guests can also opt to eat poolside if they wished. A preview of the menu. The waiter arrived and presented our menus along with a mini-reading light that was clipped to the side. 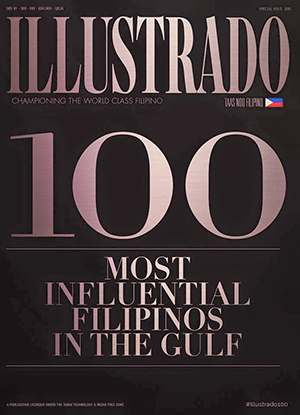 Handy, we thought. Because of how dim the area was, it does make sense to add along this detail for us to have a clearer visual of the menu items. They had a two-page menu: one for the starters, main course and desserts and the next page had the cocktails and coffee that you can choose from. For starters, we chose the Oven Roasted Prawns and Lamb Meatballs and Merguez Sausage, with the Nibbles of Spiced Crispy Corn. 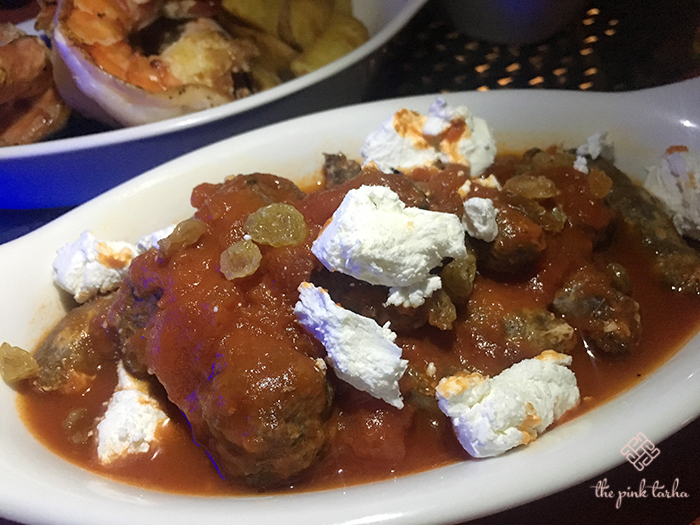 The meatballs were dressed in tomato sauce, mixed with pine seeds, raisins for a sweet note and some crumpled feta cheese tossed on top for a creamy component. J liked the meatballs more while I enjoyed the Merguez sausages. She says the meatball had less of the Arabic spices while I enjoyed it in the sausage. The sauce was mild enough to complement the strong flavors of the meat. 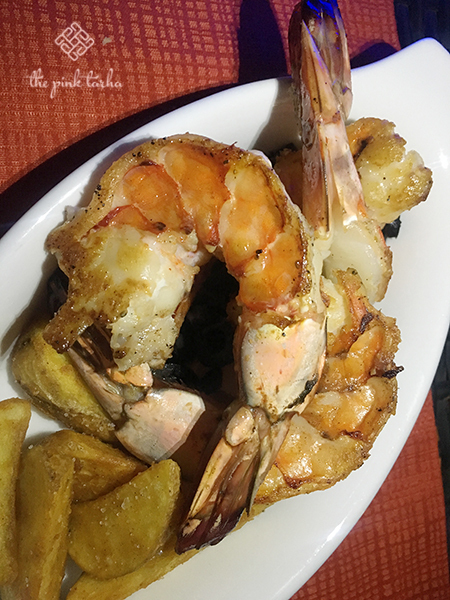 The prawns were a more superior dish for its large portion and fresh seafood flavors. The toastiness from the grill gave it a lot of character and thankfully enough, the chef removed the shell for us as he cooked it making it an easier eating experience. It came in a bed of olives with a side of potato wedges. With three huge prawns for 55SAR, we say not bad at all for value for money. Our order of the Spiced Crispy Corn Nibbles actually came long after we had finished our main course. We don’t know why, but when it did came it turned out to be a unique recipe on a corn dish. 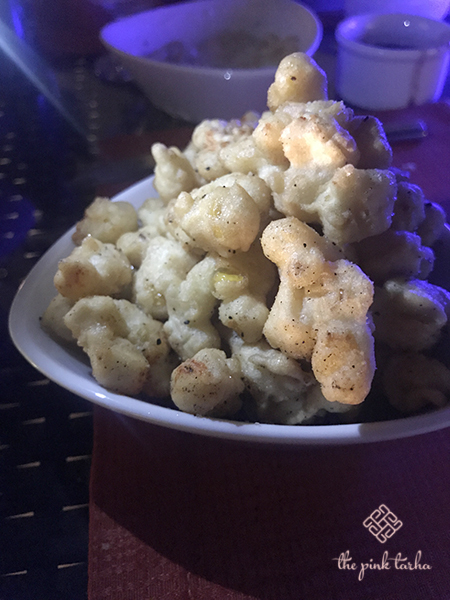 It appears to look like “cornick”, like the ones we have in the Philippines, but in fact, the kettles were doused in batter and deep fried and tossed in a spice mixture. When you bite into it, you get the fleshiness of the of the batter and the corn kettle pops in the middle. By my fifth pop, I already felt full so sorry if we weren’t able to finish that off. 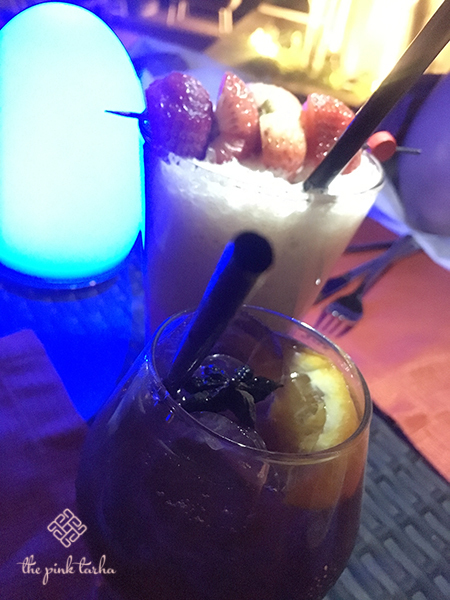 For our cocktails, we ordered the Strawberry Sensation for me and the Sangria for J. 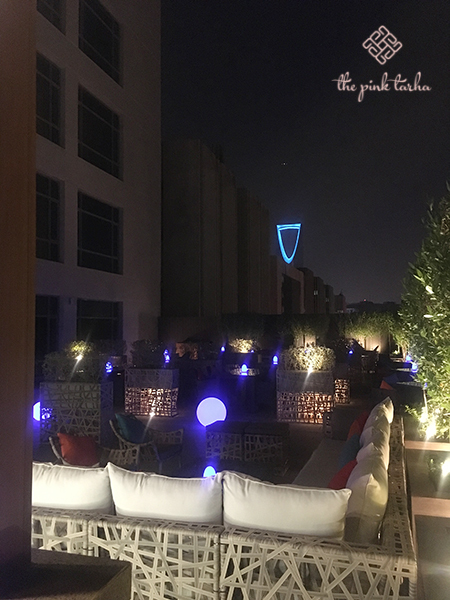 The drinks menu is a bit pricey in our opinion but in case you came to just lounge and drink only, then it’s suffice for the added ambiance that surrounds you as you sip on. 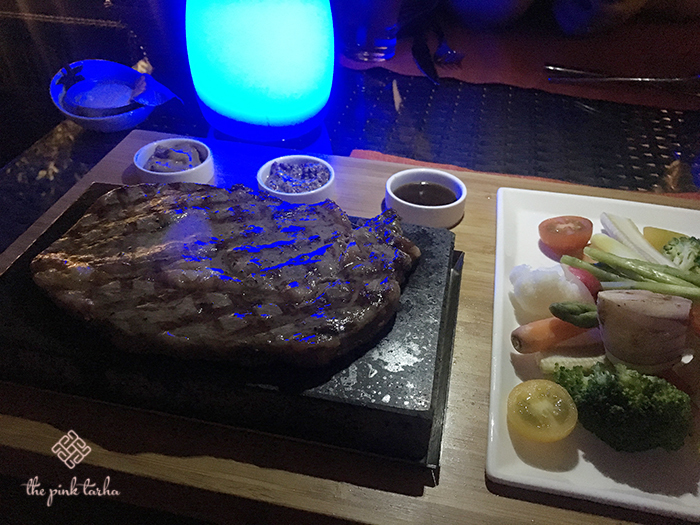 For our main course, J and I both chose to have a 225-gram, Wagyu Beef Rib Eye served on Sizzling Hot Rock. We were told that this method is one of the main concepts of the Sama Lounge wherein they store these hot marble rocks in a 400-degree heat oven and you get your meat cooked just the way you like it. We ordered ours for medium and when it got to us, it was already semi-cooked leaving us to attend to it further ourselves. 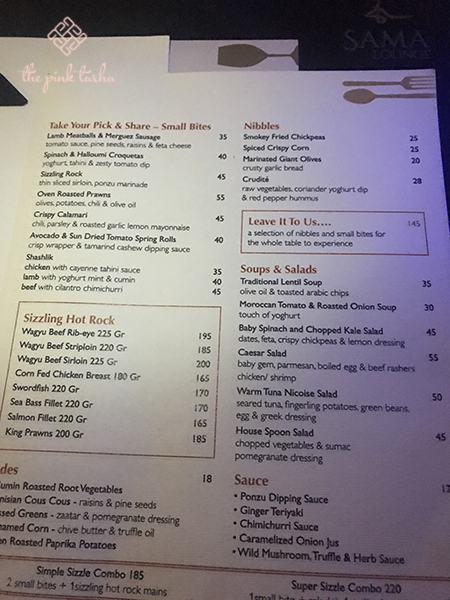 I suppose the only caveat to this method is that since the dining area is very dim, it is a challenge to take note how your meat is doing on the sizzling hot rock, so you might want to request additional lighting to surround you if you order this, so you can manage how far along your steak is cooking. 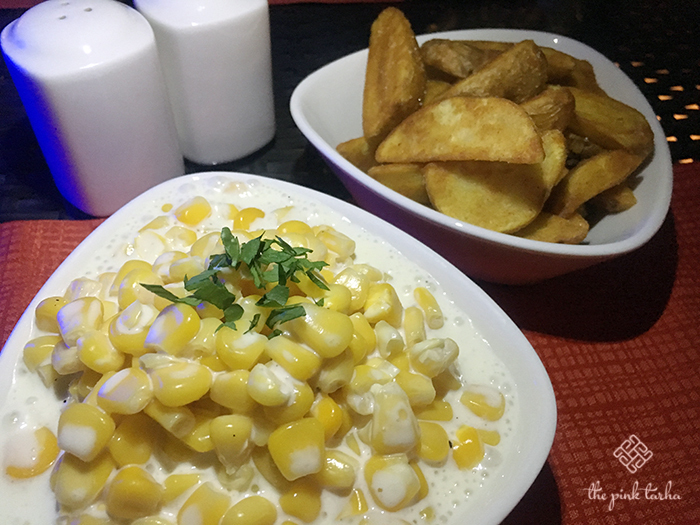 Side dish of potato wedges and creamy corn. Yum! 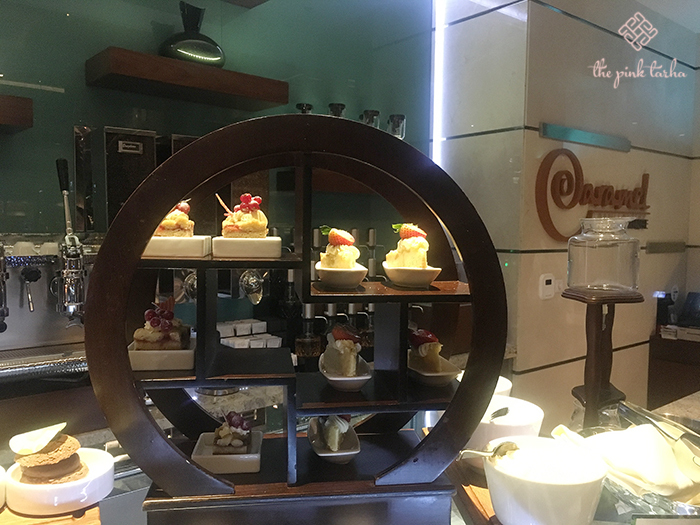 The rest of the main courses revolve around the Sizzling Hot Rock plates, which offer them in Wagyu Beef Striploin, Wagyu Beef Sirloin, Corn Fed Chicken Breast, Swordfish, Sea Bass Fillet, Salmon Fillet and King Prawns. You may choose your own side dishes and sauces to go along with your selection. For dessert, we tried their Crispy Bread Pudding and the Banana Cream Pie. J liked her choice because it was not to sweet and not too mushy. 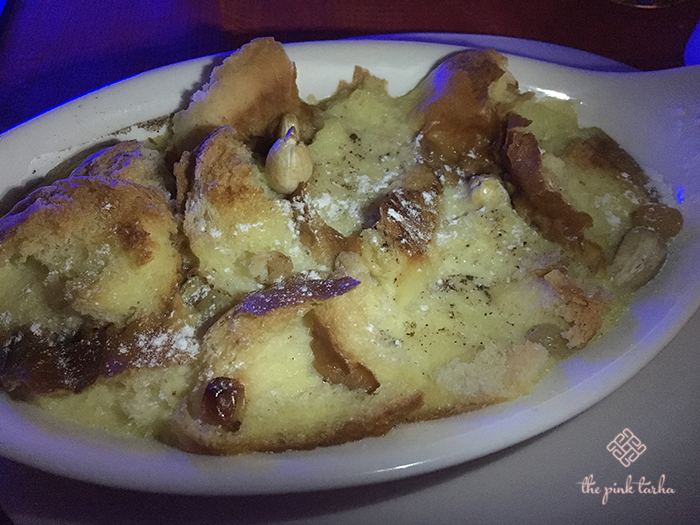 She says she was still able to distinguish the bread and that she liked the crispy top. Meanwhile, I marvelled at the simplicity of a banana sliced in half and slightly roasted with sugar on top. 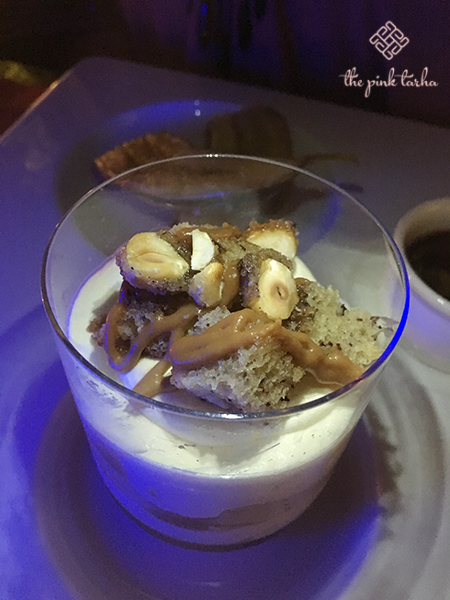 It was served in a rather deconstructed manner with the cream pie in a glass, the split banana on the side and a ramekin of sauce on the other. 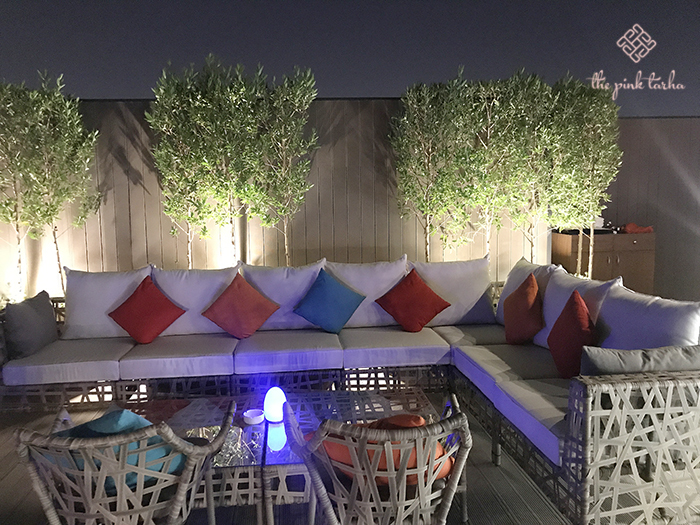 Price range is above average, and I believe what you will be banking on here is the outdoor dining experience and the intimate setting that it provides. 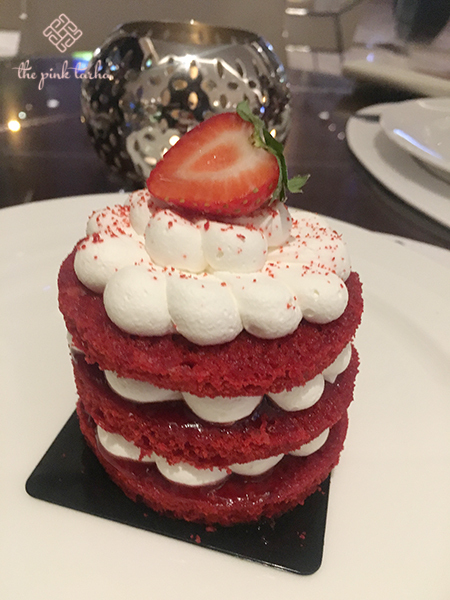 I think it’s perfect for a sweet dinner date with your special someone or a night out with your friends that’d be spent on a long chit-chat. While the weather is this good, we can’t pass it up. The Sama Lounge by the way is open for both singles and families. However, it’s still required for ladies to wear their abayas. 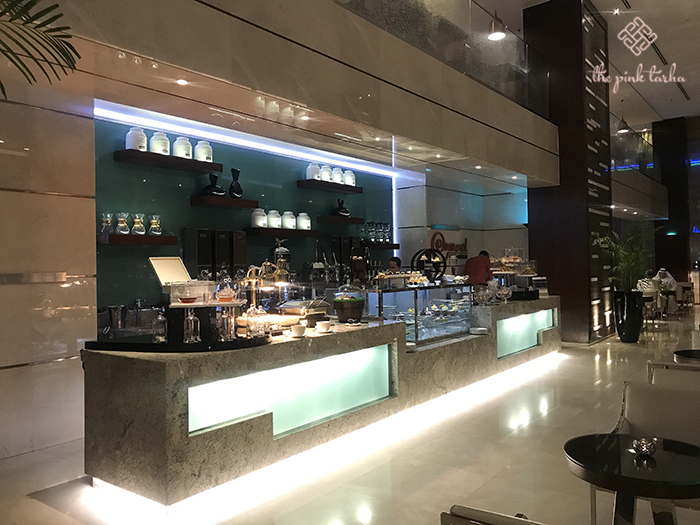 In case you are waiting for your ride home or prefer lounging indoors, you can also try out their Caramel Lounge in the Rosh Rayhaan’s lobby, which carries an extensive selection of tea, coffee and desserts. Here’s a sneak peek for your to enjoy as well. 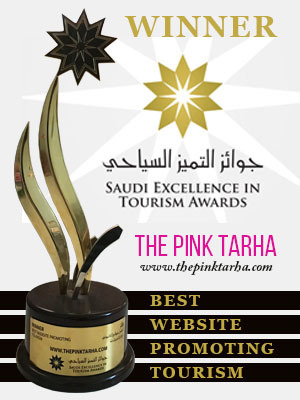 Stay for the sweet moments! Creative desserts that won’t disappoint.